Roger Stern was one of the best writers in comics in the 1980s (he’s still good today, as his Captain America mini-series supplementing Ed Brubaker’s regular series show), and his 4-year run on Doctor Strange was his very best work (it was published bimonthly from 1981-1985 – remember when comics companies used to do that?). So it’s terrific to see Marvel reprint the end of his run in this handsome hardcover volume. A brief recap: Doctor Stephen Strange was a brilliant but egotistical surgeon before a car accident wrecked his nerves, so he could never operate again. Wandering the Earth in search of purpose, he met The Ancient One, an eastern mystic who eventually took Strange as his apprentice. In the ensuing years, he grew to become Earth’s Sorcerer Supreme, and master of the mystic arts, operating out of New York’s Greenwich Village to defend the world against mystical threats. While many previous creative teams (Lee & Ditko, Englehart & Brunner, etc.) had written fine Strange stories, Stern topped them all, by mixing the cosmic with the personal. Strange became a richly characterized human being, as he lost his apprentice and lover, Clea, when he became romantically entwined with another woman, and he gained friends and allies on his adventures as well as in his household (his manservant, Wong, and his accountant, Sara, developed a romantic attachment). He had some pretty great artists, too, starting with Marshall Rogers, then Steve Leialoha, and then Paul Smith, the main artist in this volume. This story opens with a story in which Strange helps Dane Whitman, The Black Knight, throw off his family’s curse, but the story quickly shifts when Strange realizes that Umar, the ruler of the Dark Dimension, has decided that he is masterminding the rebellion against her rule. He’s not, Clea is in fact behind it all, but her persistent attacks on him force him to take the fight to her. It’s a terrific story in which we see Clea develop more fully as a character, and with a satisfying victory-from-the-jaws-of-defeat ending. The story showcases Strange’s humanity and empathy, a man who wields immense power, but who does so with conscience and wisdom. Other writers have often heavy-handedly returned to Strange as a man who achieves catharsis and enlightenment through his experiences, but Stern goes beyond that to show him as a fully mature, rounded individual, a man who still has personal and external challenges to face, but who is as much a role model as any of the mainstream superheroes who live in the spotlight that he avoids. Stern is ably assisted by Paul Smith’s art. Smith had developed considerably from his earlier work on X-Men, but was not quite as fantastic as he would be later on The Golden Age. His stuff is nonetheless terrific. Bret Blevins does a pretty good job of aping his style in a single-issue story (itself quite good) prior to the main arc. All of their work looks terrific in this reprint, and the coloring is bright and vivid, complementing their styles perfectly. 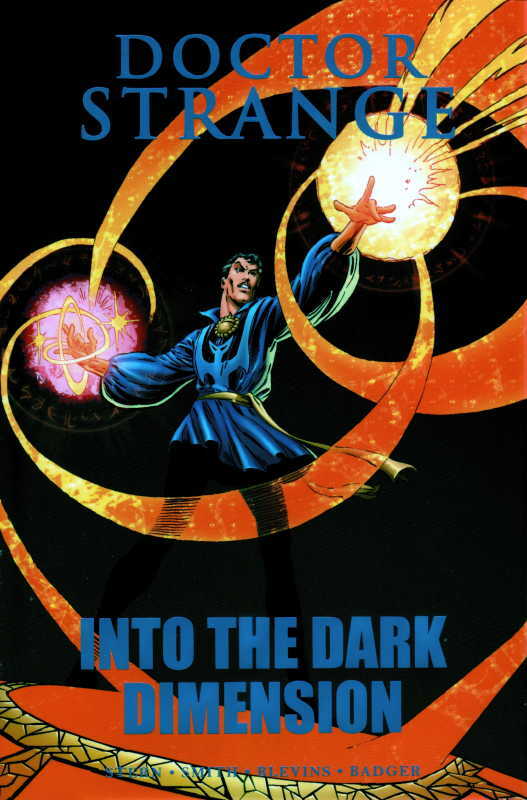 Stern unfortunately left after the next-to-last issue collected here, and Peter B. Gillis – the series’ next regular writer – wrote the code to the Dark Dimension story, illustrated by Mark Badger. Badger’s sketchy (if not downright muddy) layouts and pencils have never appealed to me, and Gillis always seemed a very dark writer whose characterizations seemed a bit too simplistic, his stories a bit too convoluted. It’s a disappointing ending to the volume (plus it tied in to the lousy Secret Wars II series Marvel was printing at the time), and I’ve always wondered why Stern departed so abruptly. That aside, the overall package is wonderful. I highly recommend giving it a try, and if you like it, go back and try out the rest of Stern’s run (mostly quite affordable in your back issue bins), starting with Doctor Strange vol 2, #48, and running through #67 (the last issue before this volume). There are many great issues in there, and I guarantee you’ll love it.